Such an honor to have so many cannabis boss babes over for a medicated mezcal Galentine's meet-up in my kitchen studio. 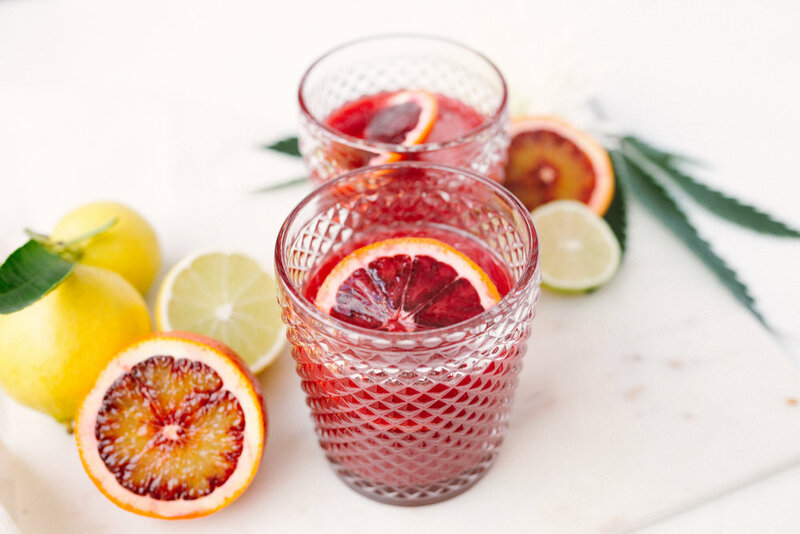 We've got a few recipes coming your way starting with this Bloody Mezcal-entine cocktail with my sous vide lemon verbena tincture made with Lemon Garlic OG from our buds at Sunset Connect. 1. Set your sous vide water bath to 70ºC. 2. Place all ingredients in a zip seal bag and seal using the water displacement method. 3. Submerge and sous vide for 1 hour. 4. Remove from water bath and let cool to room temperature before opening the bag. Strain out the solids and discard. Keep bitters in a bottle in a dark cabinet. *Always start small when using bitters and tinctures. 2-4 drops and wait 30-60 minutes for full effects. Increase dosage if needed. 1. In a serving glass, combine mezcal, lemon juice, and lemon verbena tincture. 2. Top glass with large ice cube and slowly pour in blood orange juice. 3. Garnish with blood orange slices and serve immediately.